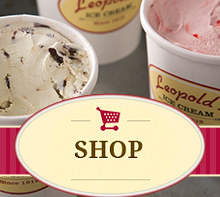 Leopold’s Ice Cream is a super-premium product made with the finest, freshest ingredients possible. Our ice cream and homemade sauces are the perfect addition to any dessert menu, café or scoop shop. We currently partner with a very select group of Savannah’s finest restaurants and shops to serve some of our classic and custom flavors. While we love our tried and true flavors, we thoroughly enjoy working with other chefs to create specialty flavors that are only available on our partners’ menus. We recently expanded our reach with a fine dining establishment in Florida. We look forward to welcoming new members into the Leopold’s Ice Cream family in the near future. To see if Leopold’s Ice Cream is right for your business, please contact us at info@leopoldsicecream.com and a member of the Leopold’s team will be in touch to discuss current opportunities.